or...Can a Leopard change its Spots? Well, I'm not a whole lot faster now, and when we started going to cat shows, the whole concept of cat breeds, long hair and short hair, and the incredible variety of color and color types struck me as staggering. I still get a glazed over look when two Persian or Oriential breeders start in why this cat, a "Seal Lynx Point" is different from that cat, a "Tortie Point"...or why this is really a "smoke" and not a "blue". Ok, you Persian and Oriental breeders, don't jump on me...I said I didn't understand it. It's unavoidable, and slowly by slowly some of the stuff is starting to creep in. A really excellent description of breeds and colors can be found at www.tica.org. If you wish, check it out. Bengals don't have quite the diversity of colors and types as some of the other breeds. In fact, to our disadvantage, several quite different colors are lumped into the "Brown Tabby" division. I'll try to make a bit of sense out of it, if I can. If any of you other breeders wish to submit me a coherent article, I'll run it instead. Here is a quick overview. At division level, there are two accepted for Championship Bengal colors. These are "Brown Tabby" and "Snow". Snow is broken down further into some sub types, Sepia, Seal Sepia, Seal Mink, and Seal Lynx Point. Within either division are two accepted pattern types, Spotted, or leopard, and Marble. 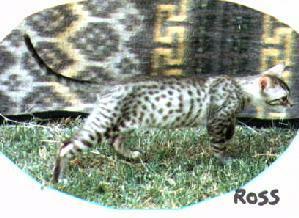 So, each color can also have the characteristic of being either a spotted cat, or a marbled cat. For example, you can have a "Brown Spotted Tabby", like Sam Houston, who greeted you on the first page of this site, or a "Seal Mink Marble" etc. Fizzy here, is also a Brown Marbled Tabby, but his colors are quite different than Sonora's. When it comes to Snows, it gets a bit more complicated. First of all, a lot of times you cannot really tell the exact type of the cat until it's eye color comes in, and it gets it's adult coat. We do have these guidelines, to help us. Seal Lynx points are completely white at birth. They are covered with a white down that disapears when they are wet. Freshly born, they look like little pinky mice, just a bit larger. When they dry off, you can see their white color. The spots start showing up in a week or two. As adults, they have startling blue eyes. Seal Minks have faint spots at birth, usually light brown. As adults they have Aqua Eyes, which I have heard described as "crystal" in appearance. Seal Sepias and Sepias are clearly spotted. These cats hold their patterns, while Seal Lynx Points and Seal Minks tend to get darker, and much of their pattern grays out. Adult Sepias have green or golden eyes. To dispel any rumors you may have heard, no actual Snow Leapord was ever used in breeding Bengals. This would be a physical and genetic impossibility. 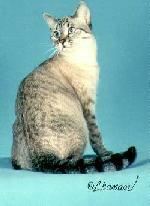 The colors come from Siamese and Burmese ancesters. The Burmese give us the Sepia and the Seal Sepia, and the Siamese is the ancester of the Seal Lynx Point. The Seal Mink is an intermediate color, which shows up if you have both breeds in the pedigree. Here are a couple of Snow pictures. As we don't breed for snows, my photo stock is very limited. If some breeder has some good snow photos, and would like to donate them to a somewhat worthy cause, send them, and I will use them, and credit you for the use. Here we have a beautiful Seal Lynx Point female. She is several years old, and you can see a bit of darkening down her back. Ross, here, is a Sepia. Not pictured, because I don't have the pictures, are the various snow marbles. Frequently, rosettes don't show up till the kitten grows up a bit, and the pattern opens up. If a cat only has one or two rosettes, they will usually appear in the center of the side, and the pattern will form something of a circle around it. This is from the tabby influence, and really is not what our goal as breeders is, when it comes to producing rosettes. To see some real rosettes, look at this photo of an actual Asian Leopard Cat. Most Asian Leopard Cats are not nearly as rosetted as this. Bengals are the only cats that have "Glitter" and some controversy abounds over it. The Asian Leopard cat is not glittered. You have to see glitter to understand it. It doesn't show up in photos, and in most artificial lighting it is diminished. To get the full effect, take the glittered Bengal outside on a sunny day. The cat sparkles. If you turn him back and forth, ripples of golden and silver dots flow across his coat. The dots are prismatic, small, and sometimes the whole hair shaft giltters, or glimmers. Sometimes you get bits of other colors also. If you have to look hard to find it, or if their is any question as to whether a cat is glittered or not, It's probably not there. Like rosettes, there is a lot of boasting and sometimes lying about whether a cat is glittered. When it first started to show up at cat shows, cats weredisqualified, because the judges felt they had been dusted with something that caused the sparkling. Whole books could be and have been written about the intracacies of breeding, colors, patterns, etc. I just wanted to hit the key spots, and throw out some photos. If you want me to include a picture of one of your cats here, send it, and I may or may not use it. In either case, it won't be returned. If you email it to me, use .jpg format so it doesn't take up my whole hard drive. Thanks for reading this far.